Evelyn's San Mateo LTK gang at Beresford Park. everydaytaichi lucy invited guest Luk Tung Kuen instructor, Evelyn Ting from San Mateo, California to conduct LTK class at Kahala Mall. everyone enjoyed her delivery, explanation of instructions and warm, outgoing personality! Evelyn, also brought an informational sheet which she had translated from a copy given out in the 1960's regarding the health benefits of doing LTK. This is Evelyn's third time here to share her expertise as her mission is to teach LTK world over. She has studied with Master Ha Kinh in Hong Kong and continues to keep in touch with the core group in HK. 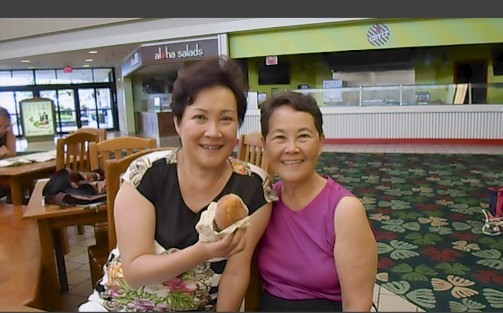 A big Mahalo to Evelyn for spending her morning with us at Kahala Mall Luk Tung Kuen. Click here for a list of health benefits for each of the 36 Luk Tung Kuen movements. is also a certified instructor of Luk Tung Kuen Chinese exercise.